The album's sound is rooted in the variety of Brazilian Music and covers a musical range from Bossa, Samba and Afro Brasil, conjured up with a taste of the golden age of the 60s. The sound repertoire is dedicated to the great composers of this time, such as A.C. Jobim, Lalo Schifrin, Getz/Gilberto and Nelson Riddle. 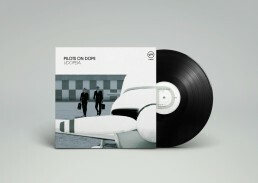 „…Pilots On Dope accommodate the anticipated euphoria with a superb album. The artists hidden behind this pretty nom de plume are two well-known musical activists. On their album, consisting of exquisite new recordings of cover versions, the two Viennese Gerhard Gigler (DJ Bunani) and Gerald Tomez act as couturiers of the most elegant arrangements. They even dared to include such jewels as Jorge Bens „La Vem Salgueiro“, Wilson Das Neves „Que È Isso Menina“, and even Henry Mancinis „Melhor Esta Noite“. Influenced by library sounds, classic bossa nova, and cool jazz, the two artists design arcs of suspense the likes of which haven’t been heard in a long time. The vocalists in this project, including the versatile Wilson Simoninha, the charming Rosalia de Souza and the ambitious Jenny Chi, emanate a rare soulfulness. The Brazil invoked before the listener’s inner eye is one of the Kodakchrome colours we know and love from old Pink Panther and James Bond films. Photos: Christoph Thorwartl (Live), Wolfgang Linhart, Universal Music Austria (Pilots on Dope), Lukas Spitaler (Stereotyp), Remix-Artist images with their permission.Videos: Franz Neuber (Live), Wolfgang Linhart (Melhor Esta Noite), Universal Music Austria© Pilots on Dope, 2017. All rights reserved. Unauthorized copying and reproduction prohibited.